The Monastic Affairs Committee of the Holy Synod, the highest authority of the Coptic Orthodox Church, issued 12 new decrees on Thursday regulating monasteries following the recent murder of Bishop Epiphanius, the head of the Saint Macarius the Great Monastery. The decrees cover issues including monks use of social media, making media appearances, and the construction of unlicensed worship sites. The decrees, which have been ratified by Pope Tawadros II, were issued after "prayers and discussions about restoring order" in monastic affairs were held. The decisions were taken during a committee meeting attended by Bishop Daniel of Maadi, the secretary-general of the Holy Synod. The prosecution is currently investigating the murder. 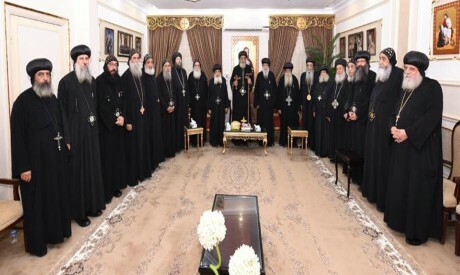 Among the decrees was a decision to suspend for one year the accepting of new candidates who seek to become novices or monks in all monasteries of the Coptic Orthodox Church. The church will also suspend the ordination of new monks as priests and archpriests for three years. The church also decided to sanction monks who construct monasteries without its approval by stripping them of their monastic and priesthood degrees. Moreover, "non-clerical persons" will be banned from attending the ordination ceremonies of monks. The decrees also prohibit any media appearances by monks, their involvement in financial operations or attending weddings or funerals without the church's permission. All monks have been given a one-month deadline to deactivate their social media accounts.